The Jobspring Experience | We Ask, You Answer! For those of us who exist in and around the technology hiring market, the sentiment we hear repeated over and over again ad nauseam is “the market is soo hot right now!” And indeed it is. If you’re a software developer using any of the modern programming languages, have at least a year of professional experience and can articulate your passions and abilities successfully, the job market is one giant open door for you. But what about recent college grads? Is the landscape for entry level programmers really so inviting? I don’t believe so. No matter who you are, what you’ve done, and regardless of what field you’re trying to break into, finding your first job can be tough. Many young parents throughout the course of history have exclaimed upon first looking at their newborn child, “It doesn’t come with a manual.” Such is the case in the world of the workforce. College was a world of comfort. You blasted through your CS program with flying colors, know C++ or Java like the back of your hand, and got a nice letter of recommendation from a few of your professors. So what happens now? Do companies just start knocking on your door asking for a copy of your resume? Well, if you have any friends who have been working in software development for a few years, that’s probably what you’re expecting. We recruiters like to provide quick witted explanations of what the market is like to help frame our candidate’s expectations. One such idiom that I myself have gone back to time and time again is “There are ten open jobs for every one qualified developer on the market.” To this day I take this as truth, but there certain caveats to that statement that need to be understood to extract its full meaning. What we’re really trying to say is that new companies are popping up every day, getting funding and generating buzz. In most cases, in order to build their ambitious software platforms they need senior level skills and experience to guide the way. On the other hand, experience has shown me that most companies that hire junior programmers are well established, have large teams, and have the bandwidth to provide a little bit of hand-holding and support to fledgling engineers. So, by virtue of the fact that there are more small startups than large, well established engineering companies, we can conclude that lots of companies want senior developers, but not as many are able hire their entry level counterparts. Want an entry-level developer position? Check the job board for openings near you. This leaves us with a seemingly impossible conundrum. As a young software developer, should you accept as fact that you won’t be able to get your first job without at least a year of real world experience? Well, if that was the case I could imagine it being a lot harder to find developers than it currently is. To guarantee yourself options, offers and opportunities upon graduation, please read the following tips and take them to heart. Do it for the love of the game. For those of us who grew up loving the movie “Space Jam,” we can recall vividly the opening scene of young Michael Jordan shooting hoops at midnight, despite his father’s best efforts to put him to bed. Michael had not yet signed a million dollar contract at that point in his life; all he knew was that he wanted to fly. You want to be a programmer when you grow up? Show your future employers that you are passionate about coding, that it means more to you than just a paycheck. This may sound like a convoluted piece of advice, but its real world application is actually quite simple: code for the fun of it. Don’t believe for a second that just because you’re taking CS classes and learning all about algorithms, syntax and object oriented principles that you’ll be the development equivalent to the number one draft pick when you start looking for a job. Too many developers graduate college with a sense of entitlement yet have no personal projects to show for their time. As someone who’s placed many junior developers at their first jobs, I can say with 100% confidence that the young developer who has tried to build things on his or her own time always gets the job. It shows passion, and more so than talent, passion and commitment build skills over the long term. 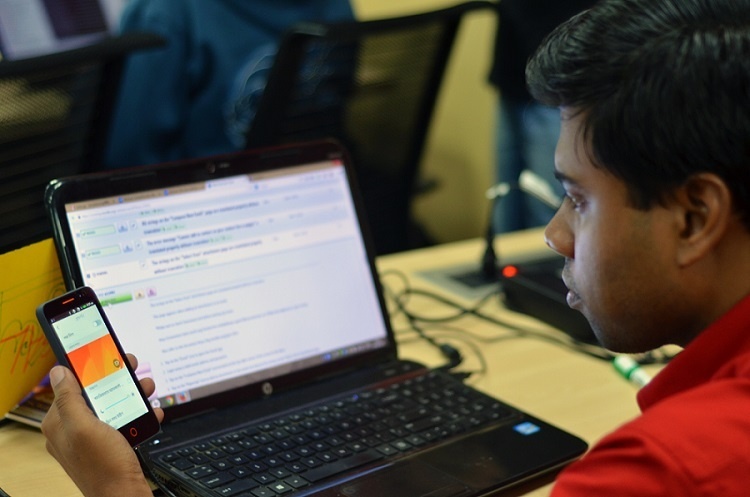 Companies want to invest in junior developers who will eventually become seasoned and versatile, and this is the strongest indication you can give a future employer that you embody these characteristics. Have your priorities straight. What should you be looking to get out of your first job? Too many junior engineers, influenced by their more senior counterparts, are practically racing to break that six figure mark, but what’s the hurry? Yes, there are some not-so-great companies that will overpay under-qualified candidates, but is that the right job for someone to build a career off of? Everyone is entitled to their own opinion on this, but I believe that regardless of what field you’re in, there are certain priorities that everyone should hold close when trying to start a career. Your first job should be about building skills. Forget money in the short term, that will come (and quickly) if you can rapidly develop your own skill set. If I had it all to do over again and chose to begin a career in the world of development, I’d look for a company with a cool product, a team I could learn from, and a support system I could fall back on. You only get one first job, so it’s important to think long term in making these important life decisions. Network within the industry. Does it ever hurt to know people? So much can be accomplished by building relationships within the tech community and it doesn’t take a whole lot of effort. Believe it or not, it’s a small world out there and the person you spent ten minutes chatting with at an Objective-C conference six months ago very well might be the person interviewing you next week. Get on Meetup.com and find events where you can meet like-minded individuals who share your interest in technology. You might learn about emerging technical trends, make new friends, or even meet your future boss. Hiring managers frequently attend meetups hoping to find passionate, talented developers to consider for their teams. Find tech events nearby where you can network with hiring managers and other IT professionals. So you’re an entry level developer who wants to break into the tech world? Prove it. Believe it or not, you’re not entitled to an amazing first job just because you finished your CS program, even if you went to a great school. Companies want to hire candidates that bring value to their organization, and hopefully this article will help a few of you out there understand how to accomplish that goal. 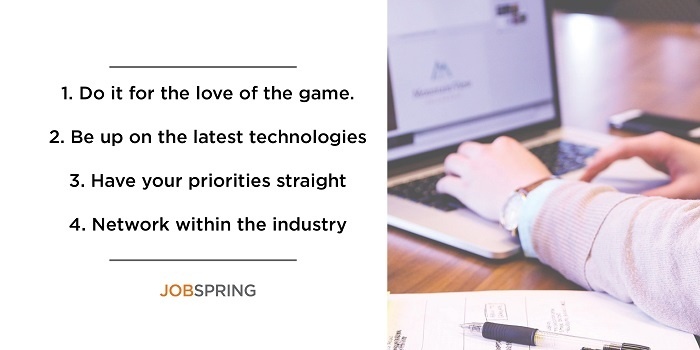 To summarize, do it for the love of the game, know what you’re hoping to get out of your first job, build connections, and stay up to date on technical trends. The world of software development offers unlimited opportunities to those who seek them; take the bull by the horns and make it clear that you want it! Related: Advice, Happy Job-Seekers, We Ask, You Answer!